College students have used it to make cheap furniture, China has had shortages of it, and main character Michael Scott of "The Office" once famously buried his face in it. Concrete is everywhere -- a ubiquity owed to its strength as a building material. Despite its strength, however, it has a pernicious but inescapable tendency to "creep," or deform progressively under mechanical stress, which leads to crumbling bridges and cracked roads. Much like Radiohead's hit song Creep was in 1993 for anyone with an FM radio, the phenomenon of creep is inescapable, at least for material solids. Despite the obvious relevance this holds for the safety of infrastructure, however, the physical origin of the mechanism has remained poorly understood, and even scientifically contested. "As a result, engineers estimate creep using empirical models, which often poorly predict creep behavior," explained Gaurav Sant, an associate professor and Henry Samueli Fellow in the Department of Civil and Environmental Engineering at UCLA. "By careful unifications of experimental and computational data, we clarified that creep originates from a dissolution-precipitation process that acts at nanoscale contact regions of C-S-H grains." Sant and his colleagues -- which includes Mathieu Bauchy, an assistant professor at UCLA -- describe their work this week in The Journal of Chemical Physics, from AIP Publishing. The researchers found that calcium-silicate-hydrates, the binding phase that holds cement paste together, tend to dissolve at high-stress regions, and re-precipitate at low-stress regions. This is in correspondence with Le Chatelier's principle, also known as "the equilibrium law." "As a result of such dissolution-precipitation behavior, a macroscopic, time-dependent 'creep' deformation manifests," said Sant. The idea of a dissolution-precipitation process is familiar to geologists -- its effects lead to deformation in the earth's crust. This the first time it's been shown to be relevant to concrete, explained Sant. The researchers' previous work includes developing vertical scanning interferometry methods to measure the dissolution rates of minerals on the nanometer scale, systematically assessing the viscoelastic behavior of calcium-silicate-hydrates, and developing methods to simulate long-term relaxation of disordered solids under stress. Taken together and applied to calcium-silicate-hydrate compositions, these contributions have given the researchers the ability to comprehensively examine and isolate the variables at play in concrete creep. The researchers' analysis also uses molecular dynamics simulations to assess how the geometric arrangement of atomic networks influences the volume relaxation of calcium-silicate-hydrate compositions. 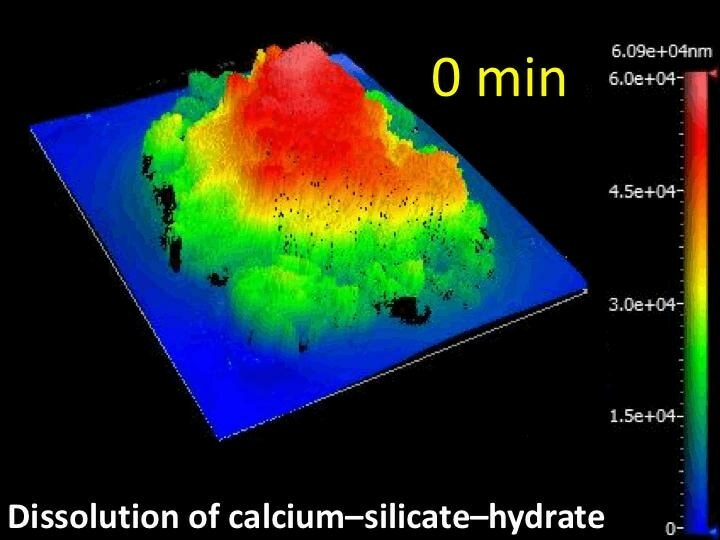 "Such behavior shows a dependence on the chemical composition of the calcium-silicate-hydrate, a result which permits identification of 'isostatic' calcium-silicate-hydrate compositions, which feature a minimum in creep and dissolution rates. This data reveals a previously unknown 'compositional route' to minimize creep of concrete," said Bauchy. Future work for Sant, Bauchy and their colleagues will involve putting together a comprehensive description of concrete creep from the atomic to macroscopic scale. This will ultimately help them develop mechanistic models for predicting creep behavior, and identification of cementation agents with reduced sensitivity to creep.